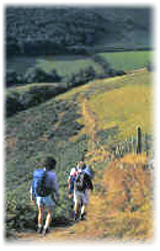 The UK is blessed with hundreds of named long distance footpath routes that have been devised and written up by organisations or individuals. Although 'unofficial', many of these recreational paths are created and maintained by county or local councils and are well planned, maintained and waymarked. Others owe their existence to the dedicated work of local ramblers' groups or enterprising individuals and may not be waymarked; but this does not mean they lack merit. Some of these routes are of equal, if not superior quality, to the National Trails, but in our opinion their importance lies in their environmental diversity and their broad geographical distribution, allowing almost everyone the opportunity to sample a path in their locality. The distances vary as much as the landscapes through which they pass, from under 20km to over 100km. The routes we have chosen all have their own distinctive character and are well worth exploring. Some, like the famous Coast to Coast Walk brilliantly conceived by A.W. 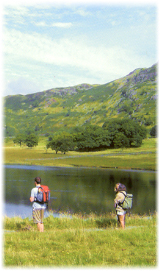 Wainwright, are a 'must do' project for any walker. Others offer a pleasurable day or two's walking if you happen to be in their locality, but which you may not make a long journey to visit specifically.